The tranquilizer auricular point is located on the tragus. You can find this point by finding the midway area between the tip of the tragus and the U shaped area also called the intertragic notch. This is also at the area where the tragus meets with the face or cheek. The tranquilizer point is commonly referred to as the “Valium Point” due to its calming, relaxing and anti-anxiety effect. Another nickname to this point is the “Hypertensive point” and is used for high blood pressure caused from chronic stress. 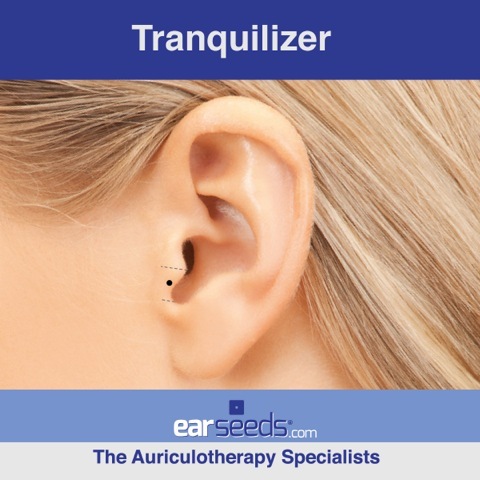 The Tranquilizer point is found in our Anxiety Ear Seed Kit.